Is e baile beag air taobh an iar Na Stàitean Aonaichte ann an Oklahoma a tha ann an Tulsa. Anns a’ bhliadhna 2011 bha 396,466 duine a’ fuireach an seo. Tha e suidhichte aig 722m os cionn ìre na mara. Chaidh am baile a stèidheachadh ann an 1836 agus fhuair e inbhe oifigeil 18 Faoilleach 1898. 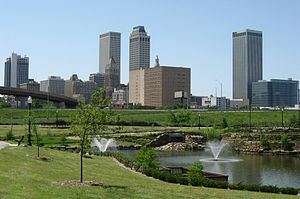 Air a tharraing à "https://gd.wikipedia.org/w/index.php?title=Tulsa,_Oklahoma&oldid=545161"
Chaidh an duilleag seo a dheasachadh 18 dhen Fhaoilleach 2019 aig 20:15 turas mu dheireadh.